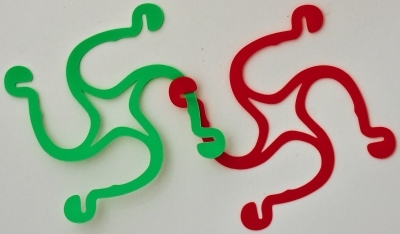 Place the arms of the two curlygons parallel to each other. 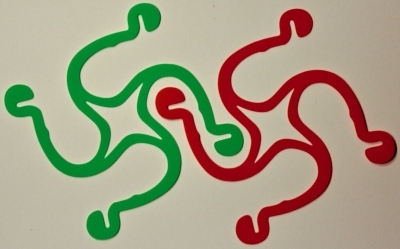 ​Important: the curlygons must have the same orientation (arms bend in the same direction, either clockwise or counter-clockwise). It's easier to add one piece at a time to a growing model, rather that trying to build it out of separate sections. When following a diagram, it's easier to start at the center and add more curlygons, in a circular manner, towards the periphery. 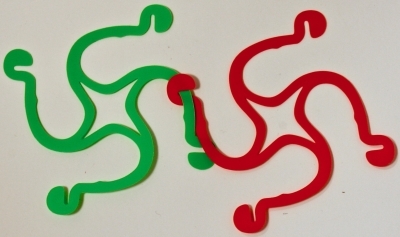 When describing a model we'll refer to a loop of 3 connected curlygons as a "triangle". 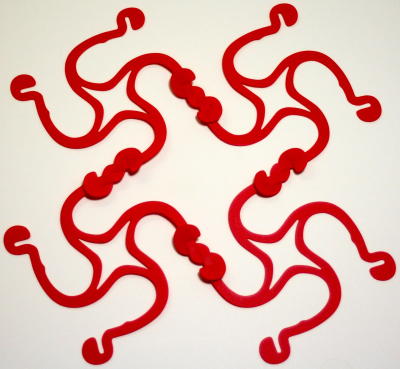 Similarly, we'll call a loop of 4 curlygons a "square", a loop of 5 curlygons a "pentagon", etc. (there are no free arms inside the loop). A 12 piece model, 6 squares and 8 triangles. Squares are surrounded by triangles and triangles are surrounded by squares. A 30 piece model, 12 pentagons and 20 triangles. 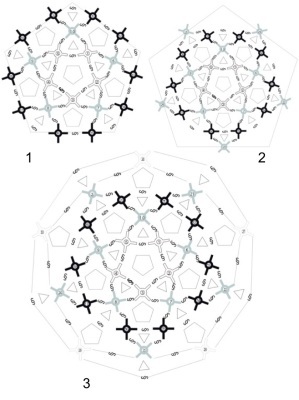 Pentagons are surrounded by triangles and triangles are surrounded by pentagons..
"Double" the curlygons to create superimposed, interweaved models! 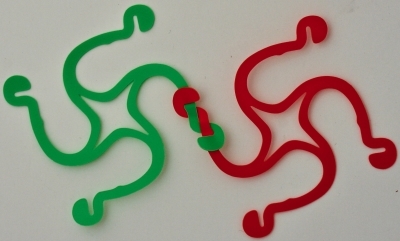 Connect the new curlygons; the new connections will always be over the old ones. 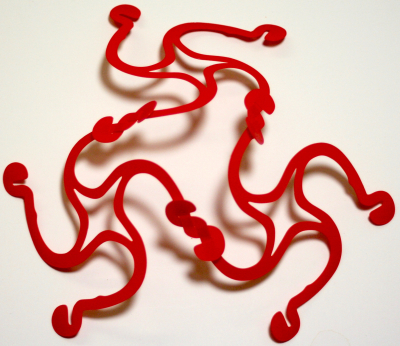 What else can we build with curlygons? WARNING! The following contains mathematical language which may not be suitable for those with math phobia. Use your discretion and proceed at your own risk. 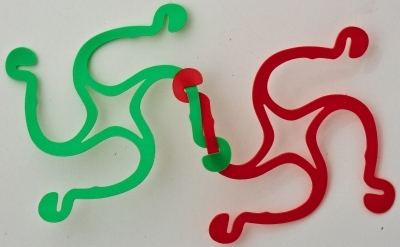 While you can connect any two arms of the pieces, including two arms of the same piece, we will describe here only those models that can be built when you connect two pieces at most once (i.e., two pieces that are already connected cannot be connected again using two different arms). We will also assume that, in any completed model, all arms are connected (there are no "free" arms left). With these restrictions, and assuming a piece represents a graph node, any construct is a model of a graph where every node has degree 4. When this graph is some connectivity graph associated with a polyhedron, we can view the construct as a model of the polyhedron that captures some connectivity property (and ignores the spatial relations such as lengths and angles). 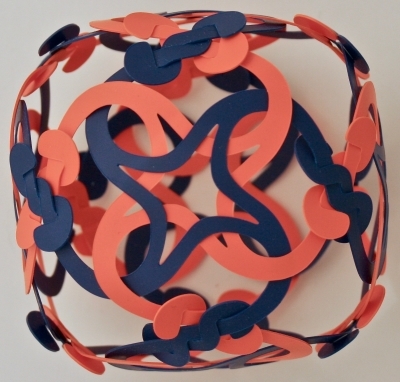 Viewing each curlygon as a polyhedron face we can thus model all polyhedra with quadrilateral faces; the curlygon loops mentioned above represent polyhedra vertces (a "triangle" is a vertex of degree 3, etc.). 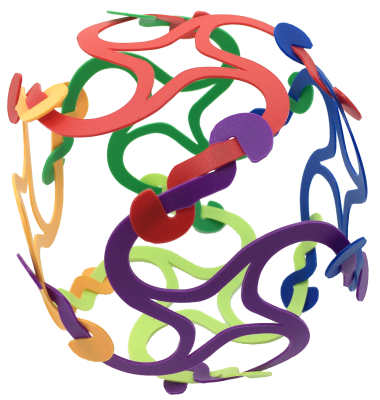 Viewing each curlygon as a polyhedron vertex we can model all polyhedra where each vertex has degree 4 with the loops representing polyhedra faces. The two polyhedra represented by a given model In these two views are dual to each other. 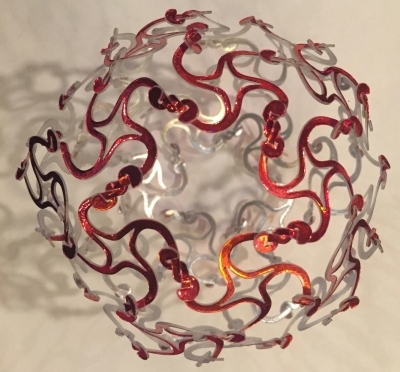 Referring to the models shown above, In the "face" view, the 6 piece model represents a cube, the two 12 piece models represent a rhombic dodecahedron and a hexagonal trapezohedron, respectively, and the 30 piece model represents a rhombic triacontahedron. In the "vertex" view, these four models represent an octahedron, cuboctahedron, hexagonal antiprism, and icosidodecahedron, respectively. From our point of view, the most interesting graph associated with a polyhedron is the "edge" graph whose nodes are the polyhedra edges; two edges are connected if they share both a face and a vertex. 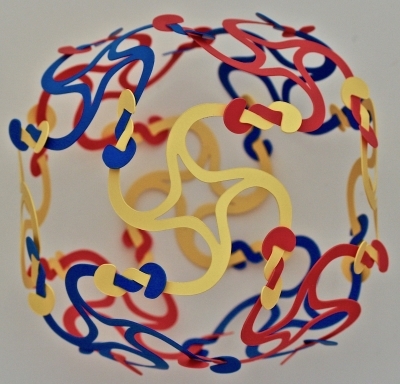 In any polyhedron, every edge is connected to exactly 4 other edges, so the edge graph of any polyhedron can be modeled with curlygons. 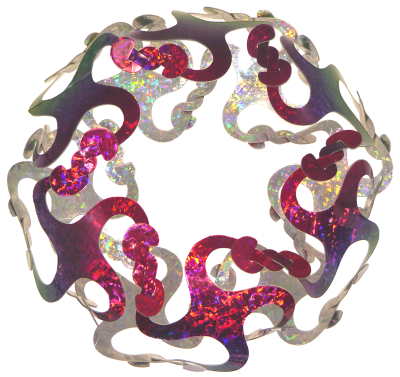 In other words, we can build a (connectivity) model of any polyhedron if we take the curlygons to represent the edges of the polyhedron. In general, duals generate the same model since their edge graphs are isomorphic; every construct can be seen as a model of both some polyhedron and its dual. In this view, the 6 piece object is a model of the tetrahedron, the first 12 piece object is a model of the cube and octahedron, the second 12 piece object is a model of the hexagonal pyramid and the 30 piece object is a model of the icosahedron and dodecahedron. 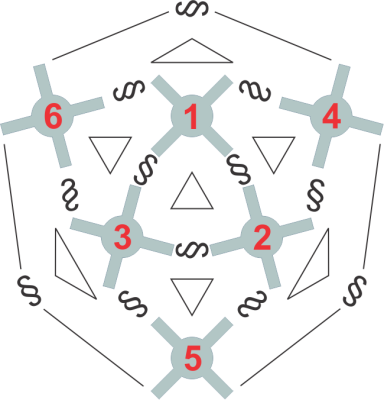 As illustrated by the 6 piece model and the second 12 piece model, the model can have a higher symmetry than the polyhedron itself; this can happen when the modeled polyhedron is self-dual. The different views are related as follows: the "vertex" view polyhedron represented by some model is the rectification of the "edge" view polyhedron represented by this model. In our examples, the octahedron is a rectified tetrahedron, the cuboctahedron is a rectified cube/octahedron (duals have the same rectification), the hexagonal antiprism is a rectified hexagonal pyramid, and the icosidodecahedron is a rectified dodecahedron/icosahedron. As an interesting observation, there are models with 6,8,9,10,.... pieces (there is no model with 7 pieces). 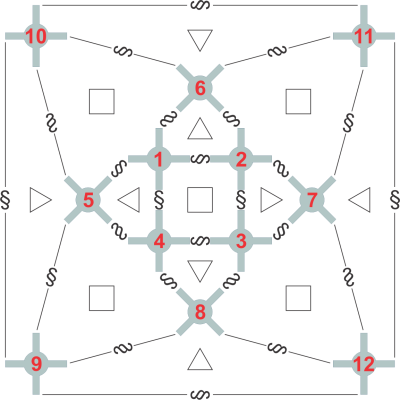 Indeed there are models with 6 and 8 pieces (a square pyramid in the "edge" view) and we can add a new piece to any model with n pieces, n >= 8 as follows: find a "face" of the model which is not a triangle (such a face always exists) and untie two connections that are on a diagonal (not next to each other). 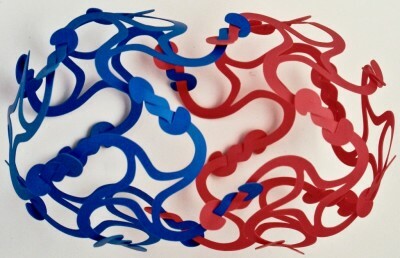 This will free 4 arms of 4 different pieces that can be now connected to the new piece. 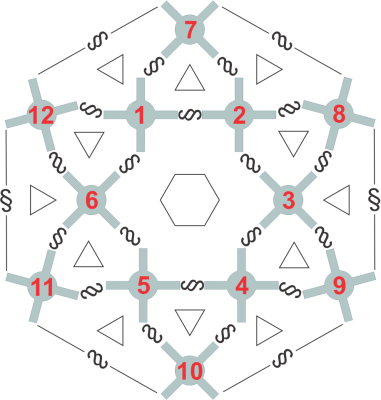 Note that there are constructs that are not "edge" models of any polyhedron, the simplest one (10 pieces, two joined cubes in the "face" view) is shown below.